Two Warren Buffett successors were named Saturday by the most credible source besides Buffett himself – Berkshire Hathaway Inc. (NYSE: BRK.A, BRK.B) vice chairman Charles Munger. In a Feb. 28 letter to shareholders, Munger said two men – Ajit Jain and Greg Abel – would both be worthy replacements of Buffett as new Berkshire Hathaway CEO. "Ajit Jain and Greg Abel are proven performers who would probably be under-described as 'world-class,'" Munger wrote. "'World-leading' would be the description I would choose. In some important ways, each is a better business executive than Buffett." Buffett penned a separate letter to shareholders, but remained silent on the subject of his own retirement. Buffett has never named a successor, only to say the BRK board knows who will replace him. Buffett will turn 85 on Aug. 30, and right-hand man Munger celebrated his 91st birthday on Jan. 1. While no one is certain when the two leaders will exit, when they do, it will surely affect Berkshire stock – and its investors. Berkshire is a $360 billion operation, and company leaders are crucial to a business' success. "Great companies have great operations and great operations usually aren't possible without a truly great CEO," Money Morning's Defense & Tech Specialist Michael A. Robinson said Dec. 30. "There's a reason to focus on CEOs – and not patents, sales figures, price/earnings (P/E) ratios, or market share," he continued. "It really starts at the top." Indian-born 63 year-old Ajit Jain is the head of Berkshire's reinsurance operations. Warren Buffett himself once credited Jain for building "this business into a one-of-a-kind giant in the insurance world" in an annual shareholder letter. 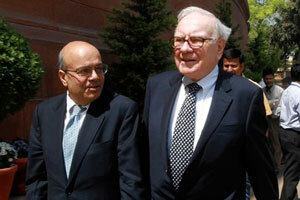 "He loves what he does, he's not looking to take my job," Buffett said of Jain at a news conference in 2011. "If he was, the board of directors would probably put him in there in a minute." In the just-released 2014 annual shareholder letter from Saturday, Munger praised Jain's reinsurance operation as a combination of capacity, speed, decisiveness, and "brains in a manner unique in the insurance business." He added that Jain "never exposes Berkshire to risks that are inappropriate in relation to our resources." Jain joined BRK in 1986. Prior to that he worked for International Business Machines Corp. (NYSE: IBM) in India from 1973 to 1976. He earned a business degree from Harvard in 1978 and an undergraduate degree in engineering at the Indian Institute of Technology in Kharagpur in 1972. With nearly 30 years of Berkshire experience, Ajit Jain is the experienced veteran candidate with a masterful financial mind.